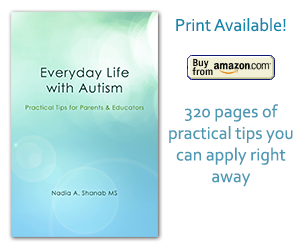 Autism Tips | Everyday Life with Autism » Blog Archive » Where Should I Place My Child? You don’t know which placement is best for your child? Don’t worry! There is a whole system and a team responsible and devoted to find the best placement for your child. By placement I mean the program and the class that best fits your child’s needs. In case you do not know about your rights, here are the legal rights of children with special needs according to the National Research Council’s Educating Children with Autism. These rights apply to the U.S.A. I am not really aware of the rights in other countries. Please, read attentively. All children with disabilities must be provided a free and appropriate public education (FAPE). Local schools are required by law to provide needed services. For children with autism, this means that no child , regardless of the severity of symptoms or expression of difficult behaviors, can be denied educational services. Each student must receive a full individdual examination, with tests appropriate to the child’s cultural background and native language, before being placed in a special education program. For children with autism, this means an evaluation that is performed by personnel with experience using and interpreting assessments for children with autism. An Individualized Education Program (IEP) is required to be developed by a team of qualified professionals for each child with a disability who is receiving special education. The law specifies that the team must include at least one general education teacher, a special education teacher, a school district representative qualified to provide or supervise specially designed instruction, an individual who can interpret the instructional implications of the evaluation results, the child’s parents, the student (if appropriate), and other individuals who have special expertise. Children with special needs should be educated as much as possible in a general education classroom. This is called the “least restrictive environment” (LRE). Ideally, for children with autism, this means that they should interact with children without autism within a general education classroom. This is called “mainstreaming”. If mainstreaming is not possible, these children should be educated in an alternative supervised setting or in a “reverse mainstream” situation, where children from a general education classroom join the special education setting. Due process ensures the fairness of educational decisions and the accountability of both professionals and parents in making those decisions. This means that parents of children with autism can call a hearing when they do not agree with the school’s plan for their children. They can obtain an individual evaluation from a qualified examiner outside the school system, and can take other actions to guarantee that both the family and their child have channels through which they can voice their concerns and interests. Parents are to be included in the development of the IEP, and they have the right to review their children’s educational records. For children with autism, this means that their parents can obtain their children’s test results and educational evaluations, and participate as an equal with educational professionals in the development of the IEP. Thank you! Your comment helps me keep it up!!! Say thank you for this tips amazing critique; this may be the type of step that keeps me though out the day.I’ve permanently prolonged been wanting around for your web-site best suited subsequent to I noticed about these from a close buddy and was glad when I was in a placement to uncover it suitable soon after seeking out for a while. Becoming a knowledgeable blogger, I’m delighted to uncover out other people taking gumption and adding towards the neighborhood. I just preferred to analyze to present my appreciation in your publish as it is fairly pushing, and plenty of world-wide-web writers don’t get the credit score they may want to have. I’m optimistic I’ll be back again and will ship out a few of my associates. I am really sorry about the inconvenience, but I cannot help you with that. very attractive blog, thanks for wiring this post!